We modified the FIFA World Cup 2010 official song to celebrate the discovery of the first example of anti-CRISPR proteins from archaeal viruses. We modified the FIFA World Cup 2010 official song to celebrate the discovery of the first example of anti-CRISPR proteins from archaeal viruses. The host of these viruses, Sulfolobus, is hyperthermophilic crenarchaeon that grows optimally at 80oC and pH 3. The generation time is around 10 hours (a week to get a colony) which makes genetic manipulation time-consuming. Luckily, there are now good genetic tools available including those developed by the laboratory of Qunxin She who is sitting next door to my office. Another positive aspect is the panoply of diverse and fascinating Sulfolobus/Acidianus viruses isolated from hot springs or solfataric fields (temperatures ~80oC) (Fig. 1). Back in the years around 2000 when I was doing my PhD in Roger A. Garrett’s lab, we started collaboration with Wolfram Zillig and David Prangishvili, and enjoyed sequencing and analysis of the genomes of viruses with different morphologies, including bottles, rods, filaments and lemons (Fig. 1). The anti-CRISPR protein AcrID1 described in this Nature Microbiology paper was identified from the rod-shaped viruses (SIRV2 and SIRV3, Fig. 1a) and homologs are also encoded by the filamentous (Fig. 1e) and lemon-shaped viruses (Fig. 1c, d). Fig. 1. 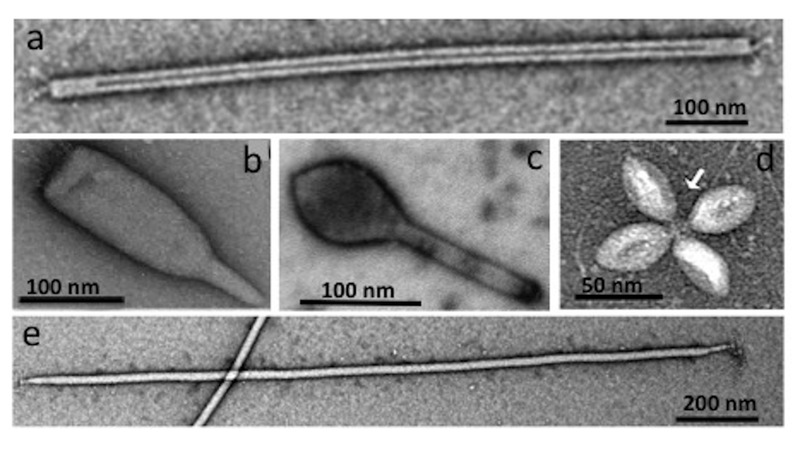 Electron micrographs of several archaeal viruses isolated from hot springs. AcrID1 was identified from the rod-shaped viruses (Fig. 1a). Scale bars are indicated for each EM. Our search of Acr was motivated by repeatedly observed genomic instability of the rod-shaped viruses. During our studies on SIRV2 entry, replication, and gene regulation, over the past several years, we noticed that SIRV2 remained stable in Sulfolobus islandicus LAL14/1 but tended to lose some genes in Sulfolobus solfataricus strain 5E6. Strain LAL14/1, but not 5E6, has functional CRISPR-Cas systems of subtypes I-A, I-D and III-B. This made us curious about possible anti-CRISPR functions encoded in those lost genes. Now one of the small gene products has been confirmed to inhibit CRISPR-Cas subtype I-D (AcrID1) activity. Strikingly, AcrID1 is no orphan among archaeal virus proteins: it belongs to a large protein family, with 12 members encoded in the SIRV2 genome alone and variable numbers in other rod-shaped and even more distantly related filamentous viruses of Crenarchaeota. By our estimates, up to 20% of the coding capacity in the genomes of these viruses could be dedicated to Acrs, suggesting their vital role in virus survival. This result raises several important questions to be answered, hopefully, in the near future. How exactly does AcrID1 inhibit the subtype I-D CRISPR-Cas? Are there Acrs against subtypes I-A and III-B in SIRV2? What are the functions of the other 11 AcrID1-like proteins encoded in the SIRV2 genome? Clearly, this is not the end of the story, the battles between anti-CRISPRs and CRISPR-Cas – and our own quest to identify and understand Acrs - will continue to be hot. With input from Eugene V. Koonin.